Govinda offers a very unique organic dessert. These delicious bite-sized confections are not only satisfying, but also nourishing to the body. High quality and a passion for detail are key in the creation of these confections. Savour the flavour – treat yourself to good health! 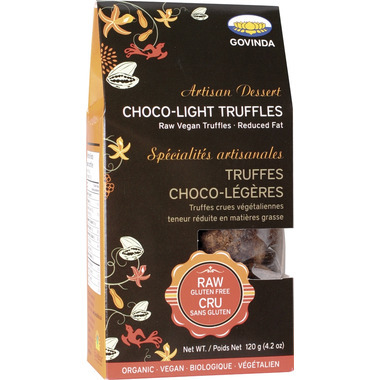 Choco-Light Truffles are delicious raw vegan truffles made with reduced fat cocoa powder. Ingredients: Organic Dates, Organic Cocoa Powder, Organic Vanilla. Origins: Dates · Tunisia; Cocoa Powder · Peru. Keep cool and dry. May have come in contact with nuts. The package says "melt in your mouth". NOT true. And also says "creamy". NOT true. They are NOT truffles. Disappointing. These are absolutely delicious! I delayed buying them because of bad reviews. The taste ? Not so great. Will never purchase again. I had 6 of us taste it and all of us agreed. YUK. Too bad...expected better. 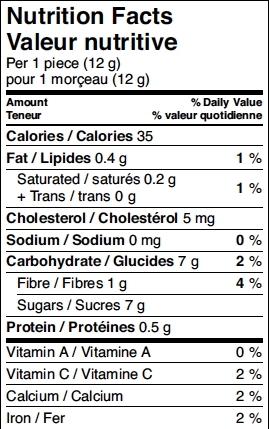 These taste like the ingredients, which are pretty healthy, but nothing special. I love medjool dates with dark chocolate, so I figured I'd love these, but they're just okay. It might be that I just don't like the type of date in these. Overall they're still decent for a healthy-ish, sweet treat... just not amazing. NOTE - these are NOT chocolate truffles. I bought these thinking I was getting chocolate and it was more like ground/pureed fruit and nuts with coco powder mixed in. I ended up throwing them away. I would not buy them again - but again I was looking for chocolate.